Cool. Now you’re caught up. # 1 Density Finishers – time sets, timed rounds, etc. # 4 Ladder Finishers – These sneaky ones will get the best of you. Now, let’s look at some more finisher approaches with a couple of awesome finishers you can plug in this week with your program. 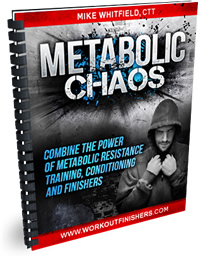 Metabolic circuits can be typically longer than your standard finisher, so they can serve as a great short workout for those times when you have a packed schedule, but you want to get the most you can out of a short workout. For example, going for a 10-minute walk is a great way to stay active and clear your head. But to be politically incorrect, you CAN’T count that as a workout. With metabolic circuits, you must use compound movements (even combination moves like the ones you’re about to do) and short rest periods. … the picture <= Ha! See what I did there? Hilarious. • Hold a pair of dumbbells at shoulder height and your feet just outside shoulder width apart. • Squat to at least parallel, maintaining an upright torso. • Pressing the weight overhead. Hey, why did my feet disappear in the second photo? Who knows. I could be floating… how awesome is that? • Start in the pushup position and your abs braced. • Perform a pushup by lowering yourself to the ground, keeping a straight line with your body. • Push through your hands back to the starting position. • Perform an X-Body Mountain Climber by bringing one knee towards the opposite elbow, keeping your body in a straight line. Repeat for the other side. • That’s one rep – repeat as necessary. • Start in the standing position as if you were going to do a bodyweight squat. • Dip down quickly into a quarter squat and swing your arms behind you by your sides. • Explode up and extend your body onto your toes, raising your arms overhead. • Control the descent back and in one movement return to the dip before exploding back up again. • This is a non-impact replacement for jumping.